Hello everyone. Welcome back to Day Eighteen of my Christmas Card Series for 2016 and today is the last day of my Christmas Card Series. I had an absolute blast making videos for this series this year it was a lot of fun and I just wanna thank all the people who left me comments, thumbed up my videos and subscribed. I really appreciate it and I hope that you enjoyed my videos for this series. 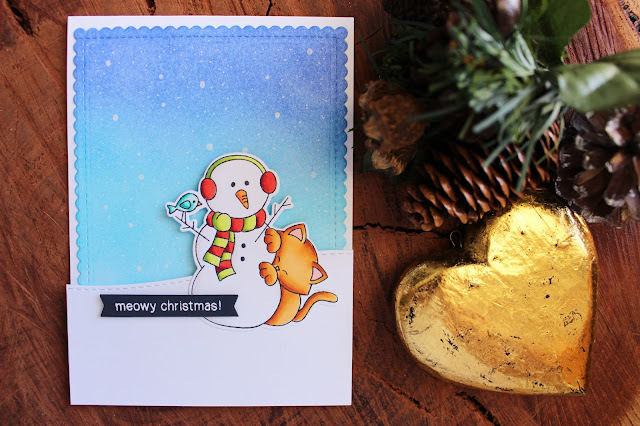 I started off with stamping and colouring the image from Newton's Curious Christmas stamp set and then used the coordinating dies to cut him out. I then moved onto the background. I cut the scalloped rectangle piece out of some watercolor cardstock with the die from the Blueprint 27 Die Set from My Favorite Things. I then used three colours of Distress Ink to make the gradient sky. I used my white gel pen to add some snow too. I then adhered the blue piece onto a card base and then die cut a snow hill using some Landscape Trio dies from Mama Elephant from white cardstock and adhered that at the bottom overlapping the blue piece with foam tape. 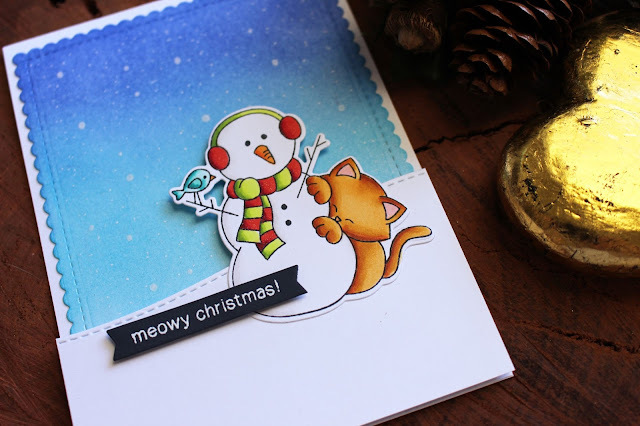 I adhered the image over top too using foam tape on the top and tape adhesive on the bottom and then white heat embossed the 'meow christmas' sentiment in white onto some blue cardstock, cut it out with a banner die included in the Blueprint 27 die set from My Favorite Things and added foam tape behind and adhered it to my card. For a finishing touch I added some more snow with my gel pen and a little wink of stella in clear for some sparkle. Thanks for watching and stopping by today. I hope you enjoyed my Christmas Card Series 2016 I know I did. I'll be back later on probably after the new year for some new videos. Thanks so much for your support in 2016, I really appreciate it!